Barcelona striker Luis Suarez was involved in a bust-up with Espanyol players in the tunnel after Barca’s 4-1 win over their rivals in the Copa Del Rey first leg match on Wednesday. According to the referee’s reports, Suarez shouted, “I'm waiting for you, come here, you're a waste of space!” at his opponents before an Espanyol player responded “I'm going to batter you” which evolved into pushes and blows inside the tunnel after the match. "At the end of the game, once in the tunnel, Barca's No. 9, Suarez, Luis, while the Espanyol players were coming up the stairs, waited for them and shouted at them on various occasions," the report said. "It provoked a confrontation between players of both clubs and the present security guards had to get involved, as did coaches of both teams." The teams had drawn 0-0 in the league on Saturday and Barca had complained about Espanyol’s overly aggressive tactics throughout the game. However, this fight continued on Wednesday’s last 16 cup tie and Espanyol were reduced to nine-men with the sending off of Hernan Perez and Papakouli Diop. Diop was given marching orders by official Juan Martinez Munuera for a verbal assault on Suarez. The Senegalese midfielder reportedly told Suarez, 'I s*** on your w**** mother,’ which led to a clash and Diop was shown Red in the process. Diop said the same thing to Suarez that Pique had told a linesman during Barca’s Spanish Super Cup defeat to Athletic Bilbao, and could face a similar ban of four games that Pique had received earlier. Barcelona manager Luis Enrique referred to the confrontation inside the tunnel as “Christmas carols” and took the sting out of the matter as he always does. However, the Spaniard will be hoping that Suarez does not face a ban from the RFEF (Spanish FA) for the incident. Club captain Andres Iniesta dismissed the incident in his post-match interview by saying that these events are common in local derbies. "Violence is a very strong word, in games like this there's a lot of rivalry and contact," he said. The clash proved to be a highly intense and fierce battle with Martinez Munuera booking 10 players - six from Espanyol, four from Barcelona - as well as showing two red cards. He also missed a stamp by goalkeeper Pau Lopez on Lionel Messi's right ankle, which could have been a third dismissal. 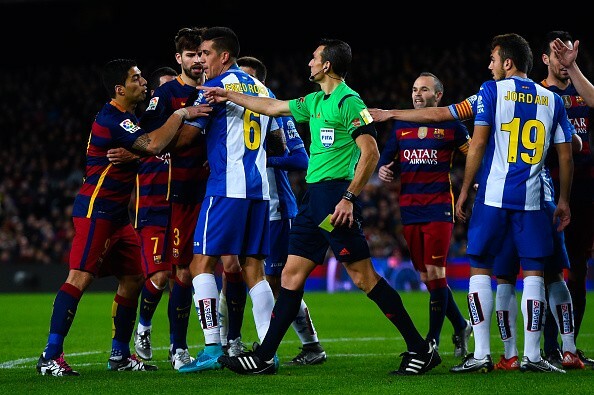 The teams will meet again on 13th January when Espanyol host the second leg.